If you're looking for a way to bring out the inner beauty of your home and also allow more light into it, we have just the solution for you. 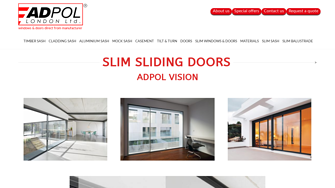 AdPol London offers you slim sliding doors. Light, with limited framing and large pieces of glass, these doors are the perfect opfion if you need to open up your home to a magnificent view. Thanks to our attention to detail, you can rely on high quality at all.